The world's best fundraising organizations rely on COHORT3's research and services to deliver strategic revenue growth. COHORT3 analysts are fundraisers, representing the best and brightest thinkers in the charitable sector. They aren't just smart - they are experienced - the average COHORT3 analyst has 15 years hands-on experience driving some of the biggest and most sophisticated individual giving programs in the nation. Our analysts have worked with the organizations such as Habitat for Humanity, American Cancer Society, ASPCA, and Save the Children, and companies like Merkle and Blackbaud. That means our analysts are systematic, but they also are practical, and results-driven, delivering specific, actionable insights and recommendations that grow revenue faster. Our analysts continuously analyze the programs, strategies, processes, technology and organizational operating models that drive faster growth in fundraising. Do you want to understand the best marketing automation software for health organizations? Or the right lifecycle stages to use in your donor journey maps for a one-time giving program? Or who are the right "influencers" to target in your influencer marketing program? We have the answers to these questions, and many more. Our reports give you the insights and frameworks to excel at donor-centric fundraising. We'll help you expand your fundraising vision, develop the strategy and plan, socialize the investment and programs, successfully execute the programs, and select the right partners and technology. Our data-driven reporting defines the modern donor shift in engagement with nonprofits, profiles market leading fundraising organizations, and practically prioritizes the latest trends and innovation. Our playbooks put it all together - guiding you from idea to successful deployment, and ongoing optimization. Work with our analysts to better understand the evolving fundraising landscape, and to translate that deeper comprehension into smarter decisions, and customized programs tuned for your organization. Leverage our analysts for unlimited 30-minute phone consults, deeper advisory sessions, or strategic program development engagements. Deepen your team's skills and expertise, and accelerate the pace of program growth. Tap our standard training sessions, or a custom curriculum to ensure your vision becomes real - an operational success. Lead by our analysts, each session incorporates a combination of best practices, interactive exercises, and comprehension assessment. Our analysts are uniquely positioned to transform how your fundraising teams execute. Connect with an exclusive network of peers, facilitated by our analysts, to help accelerate growth, and weed out risk. Count on your peers to challenge your thinking, enrich your plans, and inject their real-world experience into your strategy. Our peer groups assemble you with fundraising executives - role and vertical-specific - centered around the group's preferred roadmap and agenda. We host regular events assembling the smartest thinkers, and most successful fundraising practitioners. Our events feature COHORT3 analysts, along with the best fundraisers in the sector. Our quarterly Councils, and Annual Summit are designed to provide actionable insights, real life case studies, and practical recommendations. COHORT3's High Growth Dataset ™ is the foundation for everything we do for our nonprofit clients. Each year, we collect hundreds of data points from the U.S.'s best fundraising organizations. This data provides remarkable insights into why these leading organizations are different - and better. It unveils their fundraising program portfolio and performance, and reveals the details behind their donor experience, technology, performance measurement, organizational structure and governance, digital fundraising, audience selection and segmentation, innovation and investment, and more. So when we make a recommendation - about your team capabilities or technology stack - you are sure that it's backed by data and insights collected from the fastest growing nonprofits in the U.S.
Our Modern Donor Contours™ research defines how American consumers engage with nonprofits when donating in the modern era. The research outputs are the bedrock of our analyst insights and recommendations, and details the dramatic consumer shift to a prioritization of 'content' and 'social' over 'solicitation'and 'org-driven' marketing. This annual study cuts across four generations - Silent, Boomers, Gen X, and Millennials - and 1000's of donors, and informs our recommendations for your donor experience, ensuring we ground your donor journey in factual donor preferences and insights, drawn from the systematic investigation of American consumers. 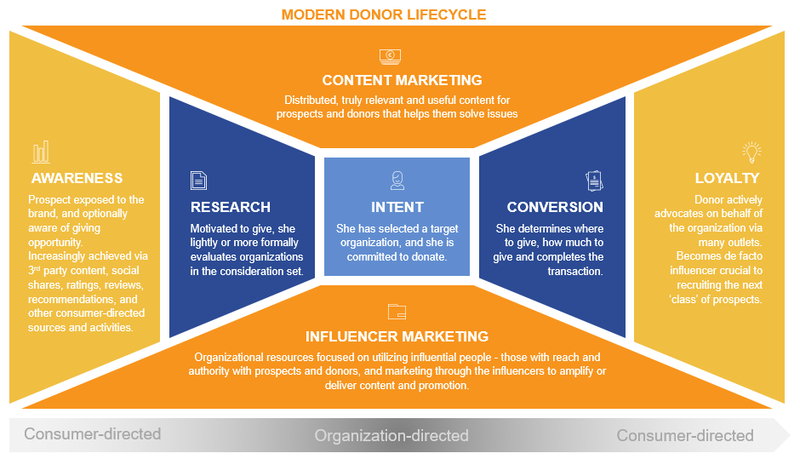 The Modern Donor Contours Study - a Generation X donor lifecycle map defined by the research.